Sponge Cake Mrs. T. Hutton Put 3/4 lb lump sugar broke into small pieces, into a 1/4 Pint of cold water just give it a boil then pour it upon the rinds of two lemons grated and the juice of one. let it stand to cool so as not to scald the egg, then add the yolks of seven eggs with the whites of five well beat seperately whisk the above ingredients full 3/4 of an hour then stir in gently with your whisk 1/2 lb of best fine flour (which is best sifted through a sieve) well dried. Paper your tins and bake in a quick oven Puffs Royal Mrs. T. Hutton Take 3 table spoonfuls of Flower mix it with half a pint of new milk. Then add the peel of half a lemon add a little cinamon, boil in the milk, then strain it off. mix your paste in a stew pan. then boil it till stiff. then put in one ounce of Butter. add 5 eggs putting them in one at a time then drop them on a baking sheet about the size of walnuts. 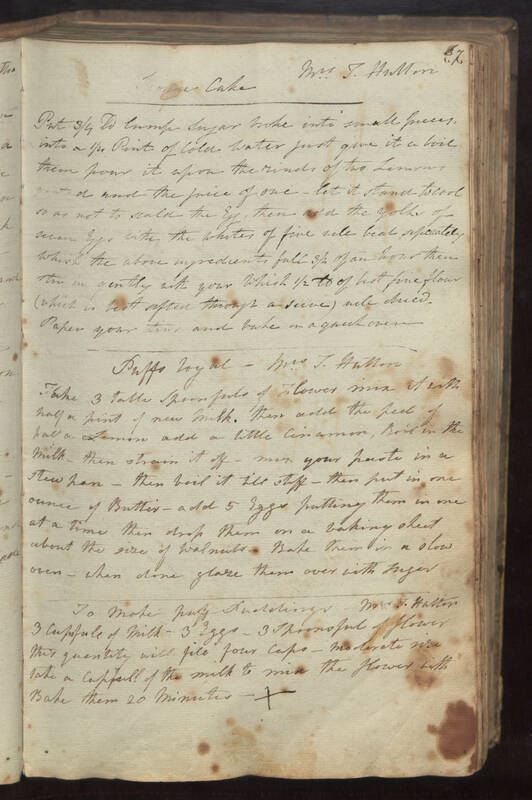 Bake them in a slow oven - when done glaze them over with sugar To Make Puff Puddings Mrs T. Hutton 3 cupsfull of milk - 3 eggs - 3 spoonsful of flower this quantity will fill four cups - moderate size take a cupfull of the milk to mix the flower with Bake them 20 minutes.